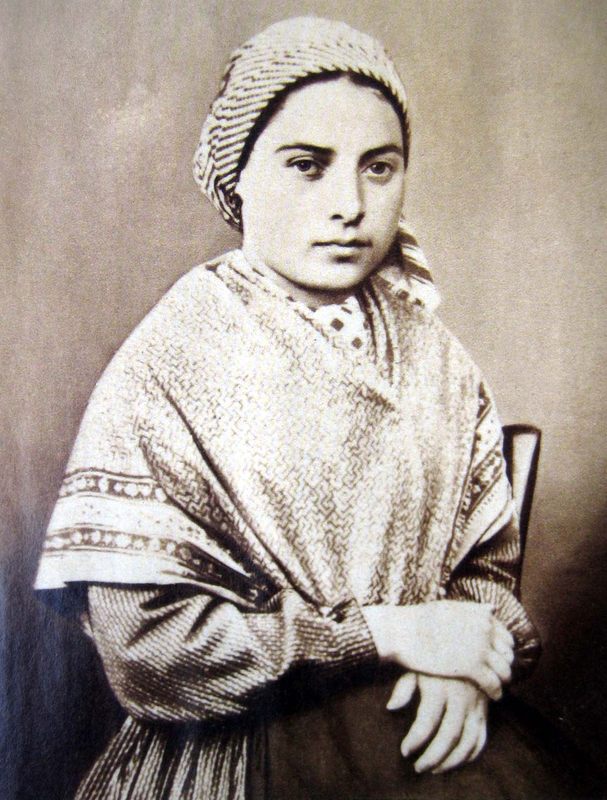 Born in Lourdes, France on January 7, 1844, Bernadette was the first of five children born to Francois and Louise Soubirous. She grew up in poverty and was often a sickly child, unable to do much because of asthma. When she was 14, on February 11, 1858, Bernadette went to gather firewood with her younger siblings. It was then that she saw a woman appear in the rock above. The woman was dressed in white, had a blue sash, blue eyes, a smile, and golden roses on her feet. When walking home, Bernadette shared the story with her siblings, who in turn spread the news to their family and friends. The woman appeared many other times to Bernadette, and a crowd began to form at the grotto. Many were skeptical about Bernadette, thinking she was hallucinating or being visited by a demon. Due to the crowds that were coming to the grotto, secular and Church authorities began investigating Bernadette, hoping she would admit to starting a hoax. But Bernadette refused and maintained the truth of the apparitions. In subsequent visits, the woman asked Bernadette to dig in the ground, revealing a spring of water. She also revealed herself as the “Immaculate Conception.” This was astounding to the authorities investigating Bernadette, since the doctrine of Mary as the Immaculate Conception had been declared only four years earlier by the Church and Bernadette, barely catechized, did not know what it meant. Many people received healing through this spring of water, and a church was later built on the site. Even with her growth in popularity, Bernadette remained humble. She discerned the call to religious life and entered a convent in Nevers, France. Many people wanted to visit Bernadette, due to her sightings of Mary, but Bernadette wanted no fame. In her life in the convent, she was given menial tasks, and took them up for love of Jesus. These simple tasks included kitchen work, helping the sick, and being sacristan. Bernadette was very skilled at embroidery and was assigned this work for altars in the convent, a task that brought her joy. As a result of her sickly health, Bernadette was weak most of her life. A few years after entering religious life, she contracted bone cancer and was often in pain. She was confined to a wheelchair due to a tumor on her knee. Even with all this pain, Bernadette offered her suffering to God with love. She who had discovered a spring that led to healing for others became the one to embrace her own suffering for love of God. When speaking of the visions, she said Mary was “so lovely that, when you have seen her once, you would willingly die to see her again!” Bernadette died on April 16, 1879, and this became her feast day. The shrine at Lourdes remains a popular pilgrimage site, and many continue to receive healing there.